“The world is a big place, but it’s gotten smaller with the advent of technologies that put people from across the globe in the palm of one’s hand. And as the world has shrunk, it has also demanded that things happen ever faster – including the time it takes to charge an electronic device. The group’s idea: Instead of having the batteries’ anode and cathode on either side of a nonconducting separator, intertwine the components in a self-assembling, 3D gyroidal structure, with thousands of nanoscale pores filled with the components necessary for energy storage and delivery. 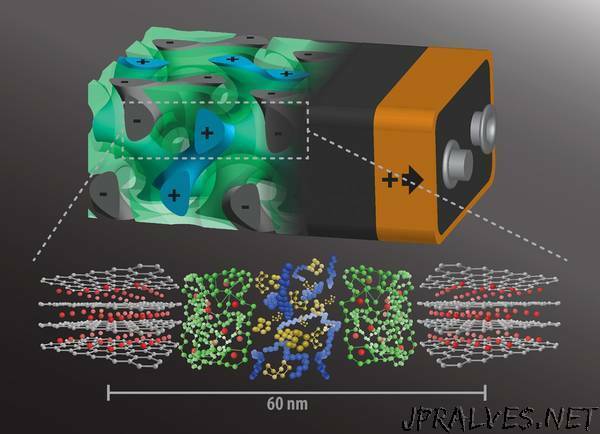 “This is truly a revolutionary battery architecture,” said Wiesner, whose group’s paper, “Block Copolymer Derived 3-D Interpenetrating Multifunctional Gyroidal Nanohybrid for Electrical Energy Storage,” was published May 16 in Energy and Environmental Science, a publication of the Royal Society of Chemistry. The architecture for this concept is based on block copolymer self-assembly, which the Wiesner group has employed for years in other devices, including a gyroidal solar cell and a gyroidal superconductor. Joerg Werner, Ph.D. ’15, lead author on this work, had experimented with self-assembling filtration membranes, and wondered if the same principles could be applied to carbon materials for energy storage. The gyroidal thin films of carbon – the battery’s anode, generated by block copolymer self-assembly – featured thousands of periodic pores on the order of 40 nanometers wide. These pores were then coated with a 10 nanometer-thick, electronically insulating but ion-conducting separator through electropolymerization, which by the very nature of the process produced a pinhole-free separation layer. That’s vital, since defects like holes in the separator are what can lead to catastrophic failure giving rise to fires in mobile devices such as cellphones and laptops. The next step is the addition of the cathode material – in this case, sulfur – in an amount that doesn’t quite fill the remainder of the pores. Since sulfur can accept electrons but doesn’t conduct electricity, the final step is backfilling with an electronically conducting polymer – known as PEDOT (poly[3,4-ethylenedioxythiophene]). While this architecture offers proof of concept, Wiesner said, it’s not without challenges. Volume changes during discharging and charging the battery gradually degrade the PEDOT charge collector, which doesn’t experience the volume expansion that sulfur does. Other collaborators on this work included Héctor Abruña, the Emile M. Chamot Professor in the Department of Chemistry and Chemical Biology, and G.G. Rodriguez-Calero, Ph.D. ’14, formerly of the Abruña group.